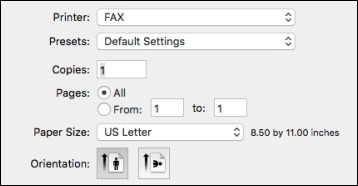 You can send a fax from a Mac printing program using the FAX Utility. You can fax up to 100 pages at a time, including a cover sheet. Open the file you want to fax. Select your product FAX option as the Printer setting. If necessary, click the arrow next to the Printer setting or the Show Details button to expand the print window. Select the number of pages you are faxing as the Pages setting. Note: Leave the Copies setting set to 1. Select a name or group from the Recipient List. 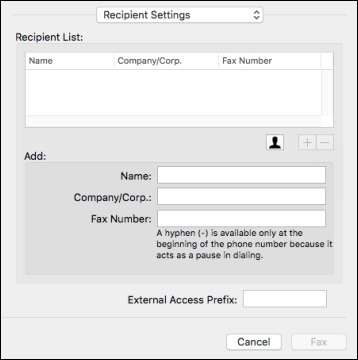 Enter a name, company, and fax number and click the + button. Click the icon and select a recipient from your address book. 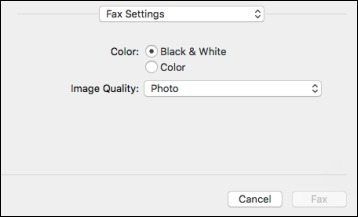 Select the Color and Image Quality settings you want to use for your fax.